By Keith Cowing on December 31, 2017 11:55 PM. "The clock ran out for hundreds of acting officials in November when a little-known law called the Vacancies Act - designed to spur presidents to staff their government - kicked in, limiting them from making official decisions. The law allows acting officials to serve for up to 300 days, at which point they must yield their authority to the agency head, unless the president has nominated someone to the job. An official action taken in violation of the law could face a legal challenge." Keith's note: If I understand this correctly, Acting NASA Administrator Robert Lightfoot could technically get caught up in this. Rep. Bridenstine's nomination was not carried over by the Senate - so the White House has to resubmit it - and sources report that they intend to do that. In the interim, one could argue that there is no active nomination for someone to head NASA. More than 300 days have passed since Lightfoot's appointment has passed (he assumed the position on 20 January 2017). Keith's update: As I now understand things when Bridenstine's original nomination is returned to the White House by the Senate, the clock for temporary appointments (like Lightfoot's) is reset for another 210 days. When the White House resubmits Bridenstine's nomination to the Senate that clock will be reset again for 210 days from the date that he was renominated and will run until he is confirmed. If his second nomination is rejected, if he withdraws, or if it is not voted on and returned, then the clock is reset again for another 210 days. Will Mike Griffin Be America's Other Space Administrator? By Keith Cowing on December 27, 2017 1:41 PM. Could the Pentagon's new R&E head take over military space programs? "We haven't laid flat the final responsibilities there, but what's really exciting about next year is we've got Mike Griffin on board," who touts extensive experience in the space domain, the deputy told reporters Dec. 21. Griffin, a former NASA administrator during the George W. Bush administration, was formally nominated this month. He has yet to have a confirmation hearing but is expected to have one in January with the goal of having him in place by the Feb. 1 creation of the R&E job. As currently constructed, the R&E office is not planned to have a heavy hand in space issues, aside from its broad mandate to help develop new technologies. But Griffin's space experience seems to have captured the interest of Shanahan as the deputy is working through broader changes to the Pentagon." By Keith Cowing on December 20, 2017 8:38 PM. "NASA announces an invitation for public nominations of U.S. citizens to serve as potential members of the National Space Council Users' Advisory Group (UAG). The UAG is a new Federal advisory committee under the Federal Advisory Committee Act (FACA) being established pursuant to the National Aeronautics and Space Administration Authorization Act, Fiscal Year 1991 (Pub. L. 101611, Section 121) and Executive Order 13803, Section 6 (''Reviving the National Space Council'') signed by the President on June 30, 2017. The UAG is purely advisory and will ensure that the interests of industry and other non- Federal entities are adequately represented in the deliberations of the National Space Council. NASA is sponsoring the UAG on behalf of the National Space Council, an Executive Branch interagency coordinating committee chaired by the Vice President, which is tasked with advising and assisting the President on national space policy and strategy. Members of the UAG will serve either as ''Representatives'' (representing industry, other non-Federal entities, and other recognizable groups of persons involved in aeronautical and space activities), or as ''Special Government Employees'' (individual subject matter experts or consultants)." By Keith Cowing on December 15, 2017 12:38 AM. "But what about plans for a return to the moon? ""First, you go to the moon before you go to Mars," George W.S. Abbey, a former director of NASA's Johnson Space Center said in an interview with the International Business Times. Abbey, is currently the Baker Botts Senior Fellow in Space Policy at Rice University's Baker Institute for Public Policy. 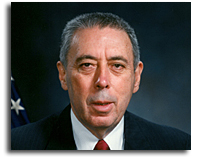 Abbey was named director of flight operations in 1976 and helped develop strategies for future moon and Mars missions. Speaking to International Business Times, Abbey said international cooperation is a key to future missions and a return to the moon is necessary before NASA can get to Mars." By Keith Cowing on December 13, 2017 11:32 PM. "The United States should seek to ensure that its space activities reflect "our values and not just our technologies," Pace urged. "We should seek to ensure that our space activities reflect those values: democracy, liberty, free enterprise, and respect for domestic and international law in a peaceful international order." To influence the development and utilization of space, the United States needs to "create attractive projects and frameworks in which other nations choose to align themselves and their space activities with us, as opposed to others." Pace praised the 1967 Outer Space Treaty, which just turned 50 years old, saying there is "no doubt" that U.S. national interests are served by conducting space activities within that international legal framework. Conversely, he lambasted the 1979 Moon Agreement as "contrary to American interests." It declares the Moon to be the common heritage of mankind with all nations sharing equitably in benefits derived from its resources. By Keith Cowing on December 13, 2017 10:24 AM. "When people question why the U.S. would return to the moon, Keith Cowing, editor of NASA Watch, a website devoted to space news, has a pretty simple answer: most people alive today have never seen a human walk on another world. "I think my generation should stop being selfish about what we did," said Cowing. "It really is time for the vast majority of the people in the world to have their chance to see this." "Take a look at the chart below. More than half of the Americans alive today never saw humans walk on the Moon - as it happened - including the person slated to become the next administrator of NASA and the entire 2013 and 2017 astronaut classes. If/when we go back to the Moon in the next 5-10 years this number will increase. For them these future Moon landings will be THEIR FIRST MOON LANDINGS. That's several hundred million Americans waiting to see what I saw in 1969." By Keith Cowing on December 12, 2017 8:54 PM. Keith's note: As former Obama OSTP official Phil Larson notes, the Space Policy Directive 1 issued on Monday only revises a very, very small portion of the existing space policy. 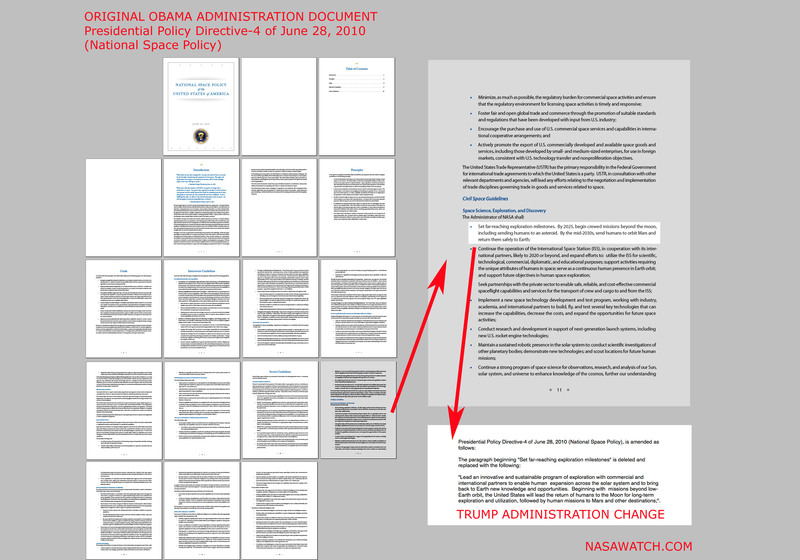 Since this White House did not change anything else it is reasonable to assume that they agree with the Obama space policy, as written. Of course, these space policies are iterative and you can trace certain themes back through the Obama, Bush 2, Clinton, Bush 1, and Reagan Administrations - and even further. To be blunt, Monday's event at the White House was a hastily arranged photo op with some spoken words. 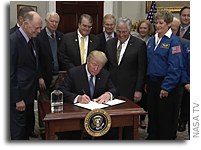 The document that was signed also represents an indication that whatever space policy the National Space Council will eventually come up with will have its roots firmly planted in what has come before. However, Space Policy Directive 1 is also a course correction - a potentially significant one that pivots NASA from Mars (back) toward the Moon - something that is far more significant than the small number of words used to make the pivot. Space policy is something that transcends Administrations and those who craft and refine it stand on the shoulders of those who came before. Sometimes a few well-placed words can have a disproportionately big impact. Sometimes. "Presidential Policy Directive-4 of June 28, 2010 (National Space Policy), is amended as follows: The paragraph beginning "Set far-reaching exploration milestones" is deleted and replaced with the following: "Lead an innovative and sustainable program of exploration with commercial and international partners to enable human expansion across the solar system and to bring back to Earth new knowledge and opportunities. Beginning with missions beyond low-Earth orbit, the United States will lead the return of humans to the Moon for long-term exploration and utilization, followed by human missions to Mars and other destinations;". "With the new NASA budget, the leadership of the agency is attempting to refocus the manned space program along the lines that successive panels of experts have recommended. The space shuttle program, which was scheduled to end, largely for safety reasons, will be terminated as scheduled. The Constellation program also will be terminated, mostly because its ongoing costs cannot by absorbed within projected NASA budget limits. The International Space Station will have its life extended to at least 2020, thereby preserving a $100 billion laboratory asset that otherwise was due to be dumped in the Pacific Ocean by middecade. The budget also sets forth an aggressive program for having cargo and astronaut crews delivered to the space station by commercial providers." By Keith Cowing on December 12, 2017 4:15 PM. "Bold goals to continue trips to the Moon and go on to Mars envisioned in the immediate post-Apollo period never gained traction, nor did pronouncements by President George H.W. Bush in 1989 or President George W. Bush in 2004. President George W. Bush's plan to return astronauts to the lunar surface by 2020, called Constellation, was cancelled by Obama after a 2009 independent review concluded that NASA would need $3 billion more per year to implement it. Obama decided to focus instead on the "Journey to Mars" with the goal of putting humans in orbit around Mars in the 2030s, bypassing the lunar surface and saving the billions of dollars required to build a lunar landing system and associated lunar surface systems for habitation and exploration." "Our second goal is to develop and test a new spacecraft, the Crew Exploration Vehicle, by 2008, and to conduct the first manned mission no later than 2014. The Crew Exploration Vehicle will be capable of ferrying astronauts and scientists to the Space Station after the shuttle is retired. But the main purpose of this spacecraft will be to carry astronauts beyond our orbit to other worlds. This will be the first spacecraft of its kind since the Apollo Command Module. Our third goal is to return to the moon by 2020, as the launching point for missions beyond. Beginning no later than 2008, we will send a series of robotic missions to the lunar surface to research and prepare for future human exploration. Using the Crew Exploration Vehicle, we will undertake extended human missions to the moon as early as 2015, with the goal of living and working there for increasingly extended periods. Eugene Cernan, who is with us today -- the last man to set foot on the lunar surface -- said this as he left: "We leave as we came, and God willing as we shall return, with peace and hope for all mankind." America will make those words come true. (Applause.)" Keith's note: Gene Cernan stood with George Bush in 2004. Jack Schmitt Stood With Donald Trump in 2017. Not much has changed - except that Apollo 17 has now been the last mission where humans walked on another world for 45 years. By Keith Cowing on December 12, 2017 9:42 AM. Notice of establishment of the National Space Council Users' Advisory Group. "Purpose: The purpose of the UAG is purely advisory and shall be to ensure that the interests of industry, other nonFederal entities, and other persons involved in aeronautics and space activities are adequately represented in the deliberations of the National Space Council. The National Space Council is an Executive Branch interagency coordinating committee chaired by the Vice President, which is tasked with advising and assisting the President regarding national space policy and strategy. Membership: Members of the UAG will serve either as ''Representatives'' (representing industry, other nonFederal entities, and other recognizable groups of persons involved in aeronautical and space activities) or ''Special Government Employees'' (individual subject matter experts)." Keith's bote: The call for nominations will be published on Thursday. By Keith Cowing on December 11, 2017 3:36 PM. "The directive I'm signing today will refocus America's space program on human exploration and discovery. It marks an important step in returning American astronauts to the moon for the first time since 1972 for long-term exploration and use. This time, we will not only plant our flag and leave our footprint, we will establish a foundation for an eventual mission to Mars. And perhaps, someday, to many worlds beyond. This directive will ensure America's space program once again leads and inspires all of humanity. The pioneer spirit has always defined America, and we're picking that up in many other fields. I think you see that. I think it's obvious. All you have to do is look at what's happening with the markets and all of the great things that are happening. We're leading in many different fields again, and it'll get more and more obvious as you go along." "Presidential Policy Directive-4 of June 28, 2010 (National Space Policy), is amended as follows: he paragraph beginning "Set far-reaching exploration milestones" is deleted and replaced with the following: "Lead an innovative and sustainable program of exploration with commercial and international partners to enable human expansion across the solar system and to bring back to Earth new knowledge and opportunities. Beginning with missions beyond low-Earth orbit, the United States will lead the return of humans to the Moon for long-term exploration and utilization, followed by human missions to Mars and other destinations;". Trump: "We are dreaming big. This is a big step to reclaiming our destiny. We are the leader and we are going to stay the leader"
Pence to Trump "by signing this directive you will allow America to lead in space once again" But Trump just said we are already leading in space. By Keith Cowing on December 11, 2017 1:41 PM. "The President, today, will sign Space Policy Directive 1 (SPD-1) that directs the NASA Administrator to lead an innovative space exploration program to send American astronauts back to the Moon, and eventually Mars." "Following the event, images, b-roll video, and interview video clips with acting NASA Administrator Robert Lightfoot and National Space Council Executive Secretary Scott Pace will be available for download." Sources report that @RepJBridenstine was invited to the White House Space Policy Directive event but that previously scheduled travel by #Bridenstine prevented that. Continue reading White House Space Policy Announcement. By Keith Cowing on December 10, 2017 8:51 PM. 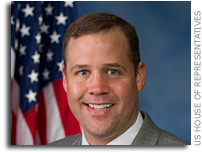 Keith's note: This White House event could serve to put some wind into Rep. Bridenstine's sails as he awaits a vote to confirm him as NASA administrator. If the White House is going to continue to throw its strong support toward NASA one can argue that this would only serve to suggest that Bridenstine will have the strong backing of the Administration in the implementation of its new space policies. In the past 11 months there have been a number of high-visibility NASA-related events with overt White House participation - more than what happened in the previous Administration's two terms. So, at this point, no one can accuse this White House of not being willing to expend political capital on NASA. Senate Democrats and Independents (46+2=48) are expected to solidly oppose Bridenstine's confirmation due to direction from party leadership - even if they wanted to vote for Bridenstine (and there are a number of Democratic Senators who would otherwise vote for Bridenstine). The expected vote tally for Bridenstine's assumes that Sen. Rubio and Sen. McCain are "no" votes. So that makes 48+2=50. That leaves a probable 50/50 vote for confirmation with Vice President Pence on hand in case a tie breaker vote is required. If the vote happens before the holiday recess then Pence could tip the balance in a tie vote. But if the vote does not happen in December and a Democrat is elected in Alabama and is seated before a confirmation vote in January - and Rubio and McCain are still "no" votes - then there could be a 49/51 vote and Bridenstine would not be confirmed. Then again everything could change. Stay tuned. By Keith Cowing on December 6, 2017 10:45 PM. An II Dec vote on nomination of @RepJBridenstine as @NASA administrator is now unlikely but other Senate business (CR etc) may delay start of Christmas recess. @VP wants this vote to happen sooner rather than later, so who knows. By Keith Cowing on December 5, 2017 11:18 PM. "This paper is designed to inform decision-makers and other interested parties on how the United States may develop national space policy to address the dynamic space environment, based on input from a variety of experts. The issues addressed here, such as space traffic management, small satellites, proximity operations, orbital debris, counterspace threats, and norms of behavior, were chosen because they are likely to demand the attention of decision-makers in the near future. In addition to highlighting the issues, the report presents an overview of options for addressing them." .... The authors recognize that the experts consulted for this paper do not constitute a scientifically selected, statistically significant random sample from the community of space policy professionals. Nonetheless, the group includes a wealth of experience and a diversity of opinions sufficient to convey important insights and lessons on the range of questions they were asked to address." Keith's note: These studies are fun to read but until/unless NASA in particular - and the U.S. government in general - can write down its top space priorities on a single sheet of paper this is just another one of those reports written by the usual suspects that will get tossed into the policy sausage grinder. Lets see what the National Space Council (NSpC) does. By Keith Cowing on December 1, 2017 12:58 PM. "Four-time astronaut Charles Bolden resigned as NASA administrator on January 20, 2017, leaving the space agency after more than seven years on the job. Since then, a former director of the Marshall Space Flight Center in Alabama, Robert Lightfoot, has served as interim director. He has held this post now for 315 days, or nearly 11 months. According to an analysis of the gaps between administrators at the space agency, NASA has never gone this long without a formal administrator. Beginning with T. Keith Glennan in 1958 and running through the term of Charles Bolden six decades later, there have been ten transitions between NASA administrators. The average gap between administrators has been 3.7 months." By Keith Cowing on December 1, 2017 12:23 AM. Keith's note: Several weeks ago I posted "Doing Something Again For The First Time" which focused on the sector of the U.S. population that was not alive when humans landed on the moon. I have had 3 publication requests to reuse my graphic. Tonight I came across another graphic on Facebook. You can see it here at visualcapitalist.com. In 2016 people talked about "flyover country" without giving it too much thought as to what it meant other than that's where Trump voters and/or Hillary haters lived. You've all heard me rant about how I think NASA needs to readjust its education and public outreach efforts so as to reach the large sectors of America that do not usually get NASA's attention. In my mind there is some overlap between the flyover country meme and what I consider to be a chronically underserved portion of America's population when it comes to NASA outreach. I used to be on the board of Directors of the Challenger Center for Space Science Education. We were always trying to understand where the underserved education markets were. I used to amuse myself by using Google Earth and its street view function to roam the U.S. at random looking for towns in flyover country that might have foreclosed buildings that could become Challenger Centers. I always found them - and they were always near big Walmart box stores. Households revolve around income - where it comes from - and where it ends up being spent. It goes without saying that more income usually means more opportunities for people. And certain skilled portions of the labor market pay better than others. Look at this map (click to enlarge). In many ways there are "Two Americas" but not the ones you normally think about. In one America ("non-Walmart America") education, medical, and high-end manufacturing jobs lead the local economy. With that is a prerequisite focus on technical and scientific skills. In the the other "Walmart" America the focus is more on retail and service economy. Yet I would submit that while both Walmart and non-Walmart Americas have different business and educational mixes, their residents both share an equal capacity and desire to learn - and explore. And NASA is historically a prime magnet for such ambitions. I'm not here to dump on Walmart. I shop there. But here in non-Walmart America when you ask someone to name the largest building in their city or town people talk about lots of universities, arenas, skyscrapers, factories, etc. Often in Walmart America the largest building is a Walmart - and you have to drive for many miles to reach it. But NASA focuses on communities where the big buildings are schools. I am going to generalize and will get in trouble for doing so. In my 30 years of working for and/or watching NASA I feel that NASA aims virtually all of itself in terms of education and public outreach as if it is only talking to the the non-Walmart parts of the country - where people have a high technical expertise, easy Internet access, vote in urban trends, and have the income to pursue careers in exciting areas such as space exploration. It is always assumed that schools have the money to implement the stuff NASA posts on its websites. That is not what you'd normally associate with flyover country. When Internet access is non-existent, school budgets are limited, and local job prospects lead young people away from (instead of toward) the chance to explore space, all of the fancy Internet stuff NASA blasts out online never makes contact. NASA has a website where you can find your town and get alerts by email when the space station is going to fly overhead. I go out every chance I get to watch it fly over my house. But what happens when your internet access requires a long bus ride - back and forth - every day - just to get those daily emails? The immediacy that non-Walmart America has to NASA falls flat in Walmart America. A space station flyover in flyover country is not all that it could be. Oddly Johnson, Marshall, Kennedy, Langley, Wallops, Michoud, Stennis, and White Sands are all in Walmart America. Yet the interest within these field centers in engaging with surrounding Walmart America on themes and issues relevant to this sector of the population seems to fade after you drive out the center gates through a few county lines or zip codes. The next time NASA crows in their #JourneyToMars tweets and SLS propaganda pieces about all the jobs that it has created in Texas, Alabama, Ohio, Florida etc. 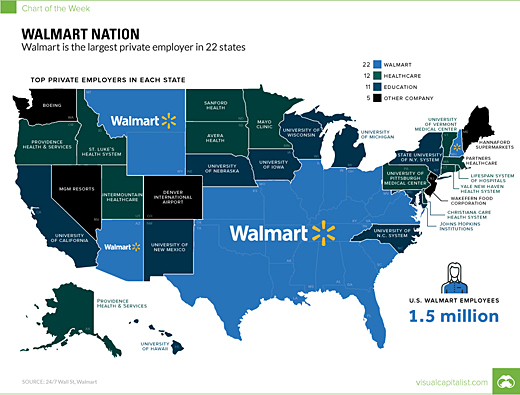 just remember that Walmart consistently does an even better job at employing more people than NASA does. Fact. I'm not proposing any solutions. Let's see what the new guy does. But maybe NASA should partner with Walmart on the whole spinoff thing and put up a booth or kiosk in every store. They have 4,600 stores in the U.S. and 140,000,000 customers walk in their doors every week. This page is an archive of entries in the TrumpSpace category from December 2017. TrumpSpace: November 2017 is the previous archive. TrumpSpace: January 2018 is the next archive.